This is a super easy and tasty meal to make in a pinch not to mention easy clean up! You can mix it up with different vegetables and proteins, just make sure they cook at the same rate or you will have raw or overcooked meat and vegetables. 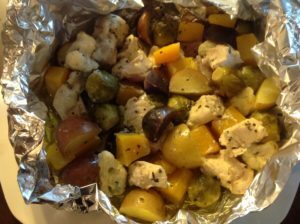 For this packet, I used chicken, baby potatoes, Brussel sprouts, butternut squash and cauliflower. The key ingredient to making this tasty is Spicewood Food Company’s Parmesan Garlic Vinaigrette or their Roasted Shallot with Truffle Oil. Both can be purchased on-line at Spicewood Food Company. Serves 2. Preheat oven to 375 degrees. Tear off a large piece of heavy duty aluminum foil about 1 foot and place on a baking sheet. Prepare the ingredients and place onto foil. Toss well with the Vinaigrette or Oil and seal packet by folding or bring all edges together in the middle. Place in the preheated oven for 30-45 minutes until chicken is thoroughly cooked (no pink should remain in the middle) and vegetables are fork tender. Serve in a blow family style or divide onto 2 plates.